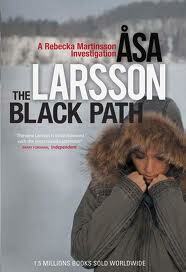 The Black Path by Åsa Larsson was published by Maclehose Press last week. The books have been published in the UK slightly out of order and this is the predecessor of the excellent Until Thy Wrath be Past which is on the shortlist for the 2012 International Dagger. In The Black Path, Rebecka Martinsson is recovering from a psychotic episode brought about by the violent events that concluded the previous book The Blood Spilt. It is one of the greatest strengths of Larsson’s writing that the protagonists never spring back from the traumas they experience but remain marked by events into future narratives. After eighteen months of treatment, Rebecka retreats to her cottage in Kurravaara, a village near Kiruna, Sweden’s northernmost city. Kiruna is a mining community in the heart of the Sami region, an area covering the northern parts of Norway, Sweden and Finland where the local Sami dialect is also spoken. Despite her breakdown, Rebecka is asked to become a special prosecutor in Kiruna for a six month trial period. Rebecka accepts but her tendency to overwork both herself and her staff make her enemies within the office. However, detective Anna-Maria Mella comes to appreciate Rebecka’s dedication and attention to detail when a woman is found murdered in a fishing ark on a frozen lake. The victim, who has been stabbed and then electrocuted is identified as Inna Wattrang, an employee of Kallis Mining, one of the top mining companies in Sweden and headed by the self-made Mauri Kallis. Although the investigations of Rebecka and Anna-Maria take up significant portion of the book, the background story of Mauri Kallis and his relationship with Inna Wattrang and her brother Diddi, form an interweaving narrative. Some of the story is moving, especially in relation to Ester the half-sister of Mauri Kellis who although adopted at birth, is integrated back into the family at great personal cost. I’m not sure that we needed quite so much back story as I felt this sometimes affected the pace of the book, although it did give a useful insight into how self-made men have to make significant compromises in the pursuit of success. In the course of the investigation, it becomes clear that corruption and bribery are a feature of mining companies’ attempts to acquire contracts in countries with unstable political regimes. This was highlighted well with the trip Mauri and Inna make to Uganda and the resulting links that are then made with military regimes. The story of the investigation into Inna’s murder linked in well with the mining background although I found the denouement slightly disappointing as the scale violence seemed out of proportion to the rest of the narrative. The book filled in some of the gaps that I had picked up when reading Until Thy Wrath be Past. It’s a shame that this series was published in the UK out of order but at least the books by this interesting writer can now be read in sequence. The book has been reviewed at Yet Another Crime Fiction Blog, Eurocrime and at International Noir Fiction. Nice review, Sarah. I think I liked this book more than you did, though I agree with you on the flaws. However, I found lots of things to like about it. I do think, as you imply, that reading out of order can reduce one’s enjoyment of a book. In this case, I’ve read the books in order, at first via the US edition (as the US published this author before the UK), in Sun Storm, which I found a fanstastic debut, introducing the character of Rebecka and I think significant for later books, in terms of her relationship with Kiruna (her childhood/family) and the people in it. This book was later published in the UK as The Savage Altar. The second book in the series, as you write, is The Savage Altar, followed by The Black Path. These three books were all published in excellent translations by Marlaine Delaney. The author then lost her UK publisher and has now been picked up by Quercus, who for some reason has published Until Thy Wrath (with a different translator, Laurie Thompson), followed by a reissue of The Black Path in the Marlaine Delargy translation. I find this ordering/publishing bizarre and a disservice to a very good author/series. I do think that the later books are best appreciated by having had the opportunity to read the earlier ones first (there are planned to be seven altogether). Sorry, the second book is The Blood Spilt, not The Savage Altar – I mis-typed. Sarah – A really fine review, for which thanks. I couldn’t agree with you more that Larsson does an excellent job of showing how characters are affected by the things that happen to them and I’m glad too that Martinsson doesn’t immediately pick up her life after the events of The Blood Spilt. The series is made more authentic that way. I think Larsson also makes effective use of the flashback (not an easy thing to do!) as we learn not just about the Wittrang family but of Martinson’s history too. She (Larsson) does that well in the other novels in the series too I think. Yes I agree Margot that flashbacks are sometimes hard to write well. I think Larsson is very good at descriptive prose and I’m looking forward to her next book. Hey Sarah, thanks for the link. I agree with you this book had way too much back story and did slow down the pacing of the book and the ending was OTT. The Black Path was a decent read for me but it was my least favorite in the series. Thanks Keishon. I agreed with your review – although I liked this book it wasn’t my favourite of hers. 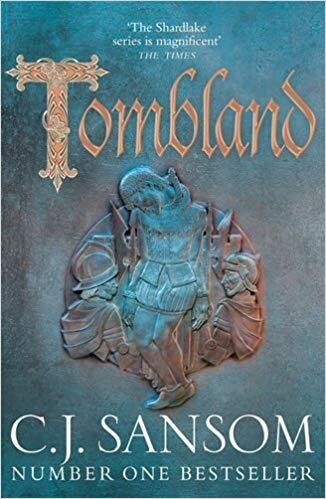 I was okay with the book mostly, until the over-the-top ending, as others have mentioned here and elsewhere. The story about the Sami mythology led me to read more about it and the culture, a good thing. However, the ending was like a totally different book, which didn’t make sense. I liked the first and second books, but those endings were very traumatic, too. I almost got PTSD after reading book 2, and knew that surely the protagonist must have suffered from it, as we find out later that she spent months in a hospital recovering. It was too much violence to foist on the protagonist at the end of the book. My favorite book of Asa Larsson’s has been Until Thy Wrath Be Past. Even though there was a supernatural element, this was the only book which I read and liked with this aspect. It was fitting here, and helped to tell quite an interesting story. And Rebekka Martinsson didn’t have to be hospitalized for months after the denouement! And she ended up with a wonderful gift for her efforts, which would please animal rescuers and sympathizers. I’ll keep reading about Rebekka as long was Larsson keeps writing.